Su-san must give a lecture in far-off Iwate, which serves as another excuse for the company president and Hama-chan to go fishing. Once there, however, Hama-chan is mistaken for the company president and Su-san for his chauffeur! But Su-san is delighted at the mix-up: he gets to go fishing with a beautiful woman working at a local inn. Based on the manga "Tsuribaka Nisshi" written by Juzo Yamasaki and illustrated by Kenichi Kitami. The comic has been serialized in "Big Comic Original" since 1979. 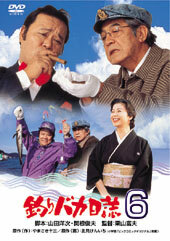 Series title "Tsuribaka Nisshi" translates to "The diary of a fishing-crazy". Series main character Densuke Hamasaki is a salaryman crazed about fishing. Ichinosuke Suzuki is the CEO of "Suzuki Construction," where Densuke works, and Ichinosuke Suzuki is also an avid fisherman.